British metal band Fury UK proudly announces that bassist Luke Appleton is to join US metal powerhouse Iced Earth, with whom the band toured across Europe last winter. Luke replaces Freddie Vidales who has announced his intention to retire from Iced Earth after completion of the band’s Chinese shows this April. 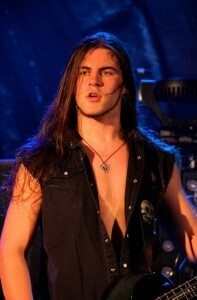 Luke’s debut shows with Iced Earth will include…. Meanwhile, Fury UK founder-member & lead vocalist/lead guitarist Chris Appleton has recently begun work on a new band, along with Fury UK drummer Martin McNee. More announcements on this are coming very soon but Chris explains initially…. Naturally, this news will have an impact on plans for Fury UK from June onwards & they’ll have more details on that soon. Meantime, they confirm the band’s UK & European shows during April & May will all go ahead as planned, with Luke in place. At the same time they also want to make it clear that the announcements today do not spell the end for Fury UK. A brand new Fury UK track “Taste The Blood” will be available to fans as a free mp3 download during the next couple of weeks, with a video also put together from the recent performances at Hammerfest (N.Wales), PPM Fest (Belgium) & Roeselare (Belgium).